For those of you starting decorating your first Christmas Tree here are my tips and tricks to make it fun and special. Allow yourself anywhere from 4-6 hours to bring out the boxes, set up, clean up, put away the empty boxes before you can sit and enjoy Tree. 1) Start by turning on some Christmas music - my favourite is Elvis “White Christmas”, but also Frank Sinatra, Tony Bennett and Micheal Buble! 2) Set up the tree and if it is and artificial tree “Fluff” the branches - this is opening up each sprig on a branch and turning them in different directions to hide the inside trunk of the tree. I then add the lights - I only use white mini lights on mine as they remind me of the stars against the dark sky. Plug each one in first to make sure it works and make sure you start at the top with the end you plug in a topper with if you have one that lights up. *My Living Room tree, an old one, but still my favourite one with individual colour coded branches. 3) Add extra greenery, different pine branches, pinecones,florals etc. This year I have added Coral Sprigs I found @ a local store called Chintz and Company. I was surprised they were on sale before Christmas…usually I look for next years additions in the sales in the middle of January. 4) I then add garland of any kind. On my tree I add pearls, antique beads, and this year I added wired Burlap Ribbon for a more casual look. 5) I also spray Faux Snow on the tips of various branches around the tree. 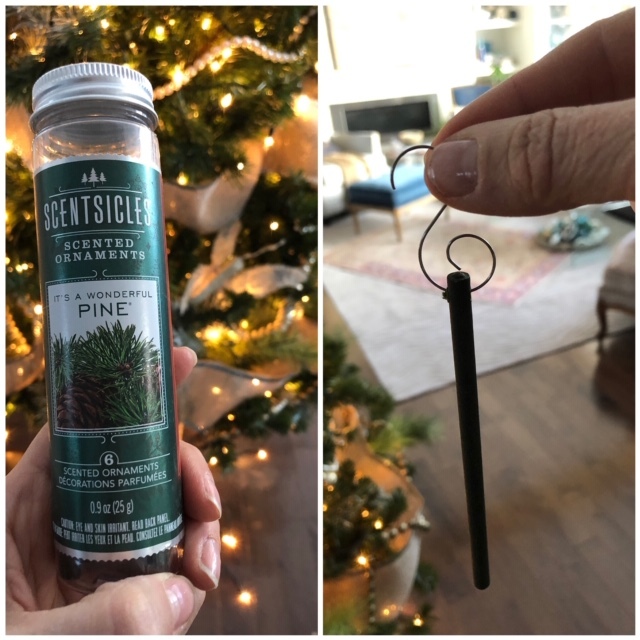 6) Add the scent of Pine with these Scentsicles Ornaments. I hang them in towards the center of the tree so they are hidden. 7) I add these Glass Icicles all over my tree to reflect the mini lights and make my tree Sparkle! 8) Start to add in your ornaments, this ornament reminds me of my Papa (my Grandpa) and our many years of ice fishing for Pickerel, Jack Fish, and Perch on Christmas morning after opening our gifts to one another and of course breakfast. 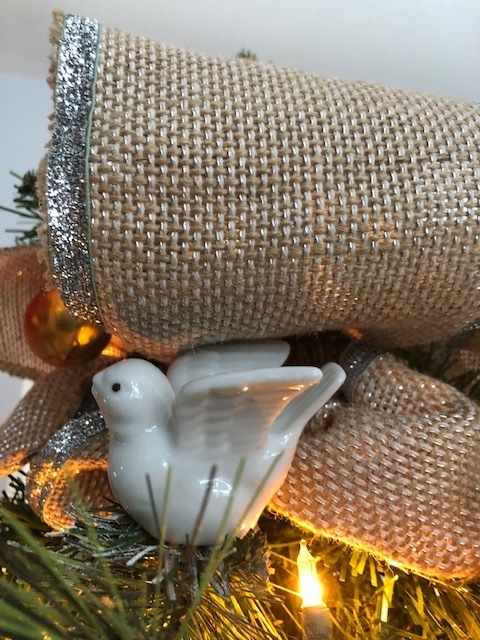 9) Tuck in special ornaments like this White Dove against the ribbon to make them stand out. 10) Sit back, relax, and enjoy your Christmas Tree in the evening!